“Sow the seeds where you reap your fruits,” says a self-made businessman, Chairman Kwon Young-Ho of Inter-Burgo Group, a conglomerate of about 20 businesses operating in Europe and South Korea. 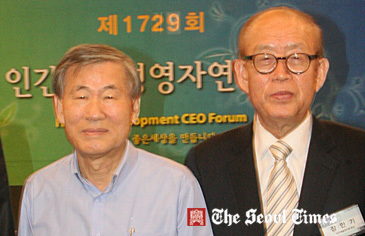 Chairman Kwon is received as the most successful Korean businessman in Europe. Based in Spain Kwon’s deep sea fishery business is now expanding its businesses into scores of other areas including hotel and golf. On Feb. 23, 2012, Kwon was invited to a breakfast forum at Lotte Hotel in downtown Seoul and spoke in front of nearly 100 local CEOs and businesspeople. Kwon emphasized his principle of investing his business proceeds to the place where he reaped his profits. Chairman Kwon Young-Ho (left)of Inter-Burgo Group poses with Chairman Chang Man-Key (to his right) of the Korean Human Development Institute (KHDI) at KHDI breakfast forum. Kwon spoke about an hour under the title of “Social Responsibilities of Businesses,” which earned Kwon several rounds of ovations from the audience. As one of the most frugal business leaders Kwon has been practicing his business philosophy of sharing his fruits with other needy people. Some 30 years ago Kown started his deep-sea fishing business with a small scrapped ship he bought with 20,000 US dollars. But, he proceeded with his plan. “I never give up even if there is only 1 percent of possibility,” he added. Now he is the owner of a mighty fleet of 40 huge deep-sea fishing vessels. Kwon is widely hailed by people of Spain and Angola as the shipping magnate. Armed with the tireless passion for the wealth he worked like a horse. Born frugality and his careful management of his time also helped a lot. “I never had time for my friends and hobbies I only worked,” he said about his life of the past 30 to 40 years. Literally Kown lives a humble and frugal life. He drives a small car himself and eats humble meals with his employees. “Now there should be no more students who cannot study because of poverty,” Kwon said. Kwon said that he wanted to teach those poor but smart students how to catch fish instead of merely providing them with fish. 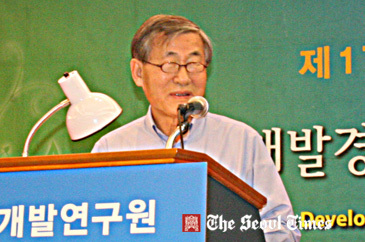 Kwon established “Dongyoung Scholarship Fund” in 1986. Since then 15,000 students have become recipients of his scholarship, including students of Africa and China as well as Korea. Kwon has spent a total of 14 billion won so far for the students. Presently, with over 20 affiliates Inter-Burgo Group’s annual turnover reaches 100 billion won (some 900 million US dollars). "The Boy Who Became Successful"